Rheinmetall has announced another rise in consolidated operating earnings for the first half of the year, with both sectors of the technology group making a positive contribution to the earnings growth. The Rheinmetall Group’s sales decreased by €55 million or 1.9 per cent year-on-year to €2.75 billion in the first half of 2018 (previous year: €2.8 billion). Adjusted for currency effects, however, the decline is only 0.6 per cent. This sales development related exclusively to the first quarter, in which, in particular, bottlenecks in the supply chain, deliveries postponed at customer request and a lack of export licenses due to the delayed formation of a government in Berlin had a negative effect on business volume in the defence sector. By contrast, the sales trend in the defence sector in the second quarter again showed growth compared with the previous year. In addition, the automotive sector increased its sales by €26 million year-on-year in the first half of the year. Consolidated operating earnings performed positively. They rose by €20 million or 15 per cent to €154 million. The group’s operating margin thus grew from 4.8 per cent to 5.6 per cent. The order backlog in the Rheinmetall Group remains at record level. As of June 30, 2018, it amounted to €7.0 billion after €7.1 billion on the same date of the previous year. The proportion of international business activities remains high at 77 per cent at group level. The defence sector increased its operating earnings despite a declining sales volume in the first half of the year. Sales fell by 6.0 per cent from €1.34 billion to €1.26 billion (-3.4 per cent after adjustment for currency effects), with the decline in the first quarter of 2018 being partly offset in the subsequent quarter. After €509 million in the first quarter of 2018, defence already increased the sales volume to €754 million in the second quarter of 2018. Rheinmetall MAN Military Vehicles Australia (RMMVA) supplies logistic and tactical military vehicles and provides services to the Australian and New Zealand defence forces. The services include project management, systems engineering and integration, through life support, maintenance and repair, as well as spare parts management. RMMVA has over 100 personnel in several locations across Australia and New Zealand. 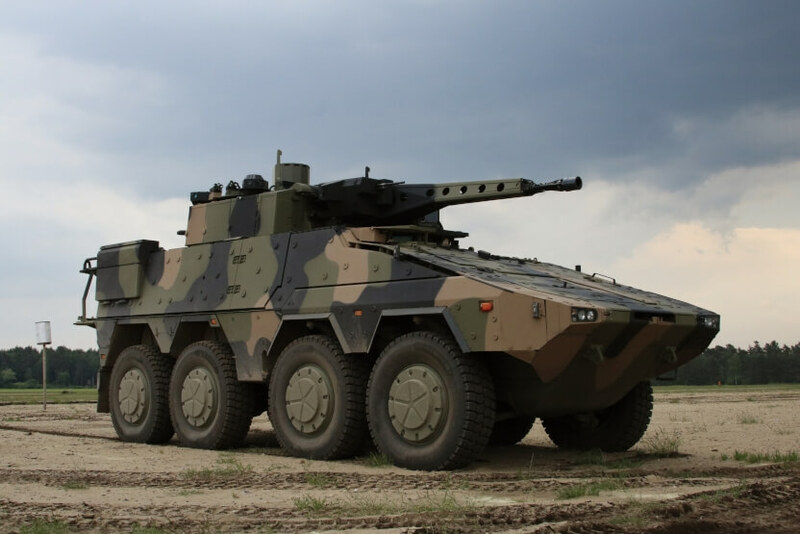 RMMVA signed the LAND 121 Phase 3B contract with the Australian government to supply over 2,500 protected and unprotected medium and heavy logistic vehicles and 3,000 specialist modules to the ADF. The first vehicles and modules were delivered in April 2016 and deliveries will continue through to 2020. Rheinmetall Defence Australia also successfully secured the LAND 400 Phase 2 Mounted Combat Reconnaissance capability, with it's Boxer 8x8 vehicle. This will be backed by an enduring commitment to Australian industry and the creation of a robust support package to deal with the emerging complexity associated with LAND 400 Phase 2.